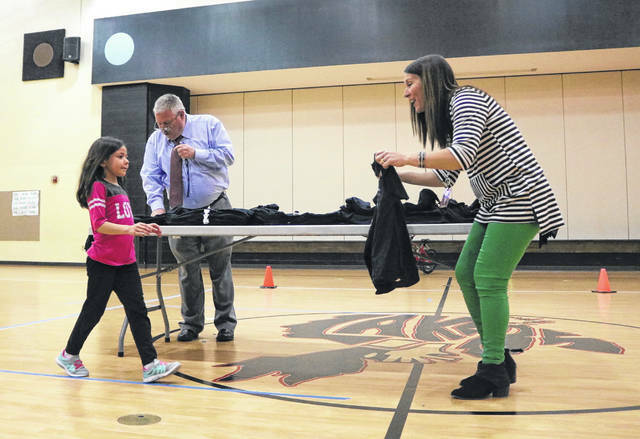 Indian Lake Elementary co-principal Molly hands a redesigned Laker Zone shirt to first grader Ally Stillgess. 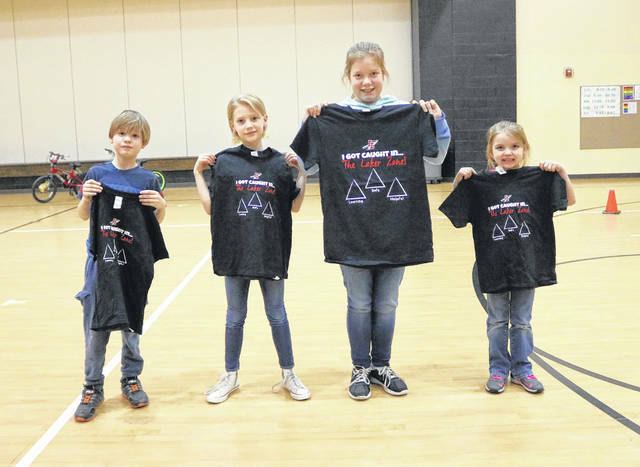 Bus Laker Zone winners Isaac Reed, Raelin Klofta, Raelyn Horne and Sugar Daisy hold up their Laker Zone shirts. Records were set and the new T-shirt design was debuted during the recent Third Quarter Laker Zone assembly. The Zone Buster revealed that 1,004 Laker one cards were handed out during the nine weeks since returning from Christmas Break in January. That’s an all-time record. In addition, Mr. Reprogle unveiled the new black Laker Zone T-shirts. Finally, the Laker Zone PBIS team showed a video they made helping students understand how to safely walk to the pick-up zone and bus lines. Then Laker Zone winners for the past nine weeks were announced. The Laker Zone is a long-time positive behavior program that encourages students to help others, resist bullying and be hard workers in the classroom. In addition, 142 students and several staff members were recognized for having perfect attendance in the third quarter. Second grader Owen Slagle and 3rd grader Kenzley Pertuset were the randomly selected winners of the perfect attendance bikes.